Representatives from each club or chapter must be present for the mandatory work night in order to set up pens, etc. If unable to attend, please call your respective Department Superintendent. Club members must be present for dismantling and cleanup of pens from 8 a.m. to 10 a.m. on Sunday, or all premium monies will be withheld. Herdsmanship contest is throughout the Fair. Banners to 1st place in FFA Competition will be on a club or chapter basis. The purpose of the contest is to encourage exhibitors to care for livestock, pens and equipment properly and to display their exhibits in a showmanship manner, keeping stalls and animals clean and attractive at all times. A judging committee will examine pens and livestock during the fair. 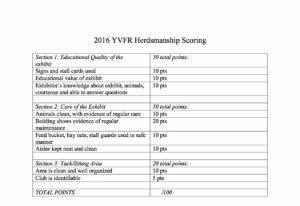 Time of judging will be decided by herdsmanship lead each year and may include random inspections. The first inspection will be on Tuesday after 6:00 p.m. , the last inspection will be on Saturday evening before 10:00 p.m. Clubs and Chapters will be judged and the scores posted after each inspection. All maintaining 75% or above in club Herdsmanship will receive premium monies. Tack, equipment, and displays shall be left in place until 8am Sunday morning. 4-H will be awarded monies depending on small or large club size. White ribbons to those with average of 75-79 points. Clubs and chapters or parents must furnish all necessary equipment for Herdsmanship. Items you will need or should have on hand: brooms, dustpan, small scoop shovel, a pair of wire pliers, wheel barrow and anything that will help to clean pen or pens of animals that are being shown. Superintendents are not responsible for furnishing these items!! Club and Chapter leaders must verify the clubs and/or chapter information in the Livestock Office for premiums to be paid. Premium checks will be mailed to those meeting herdsmanship requirements. All checks issued against the Yakima Valley Fair & Rodeo must be cashed in 90 days or they will be considered a donation to the Yakima Valley Fair and Rodeo. Scoring guidelines will be posted outside of livestock office and on the website prior to fair. Leaders and advisors may look at score sheet in Livestock Office daily. Club displays must include the club name, fair theme, educational information about the species being shown, exhibitors stall cards and cost sheets. Displays should be easy to read. Decorations may be used at each club’s discretion, but in no way should they create a fire hazard or block view of animals. Parents’ and leaders’ help will be permitted until Tuesday at 8:00am. From then on, members are to do the work. Points will be deducted from each inspection if parents are helping. Older members are encouraged to assist younger members. Feed buckets are to be removed when animals are not being fed. Superintendent has discretion to have feed buckets removed if considered a mess. Water is to be available to animals at all time. Exhibitors shall not block spectator’s view of the exhibit. Stalls must show steady attention. All stall cards and club banners, etc. must be in evidence at all times and displayed in a proper manner. All tack boxes must be closed except when owners are getting supplies out of them or putting things away (exceptions to be made during exhibitors show time.) Equipment must be stored neatly. Equipment such as sheep blocking stands must be stored inconspicuously when not in use. All evidence of grooming, such as wool-clippings must be removed. All manure must be removed at all times. A covered manure pit or spreader will be designated. The Herdsmanship Superintendent shall review the livestock and poultry area from time to time during the Fair and shall be empowered to point out to the exhibitors any violations of the Herdsmanship Contest. If such conditions are not corrected, the offending member of such 4-H club or FFA chapter will be determined by the Herdsmanship Superintendent and the Club and/or Chapter leaders and the Fair Directors will be empowered to withhold premium monies from that exhibitor . If violations continue during the span of the fair the member and/or student may not exhibit the following year.